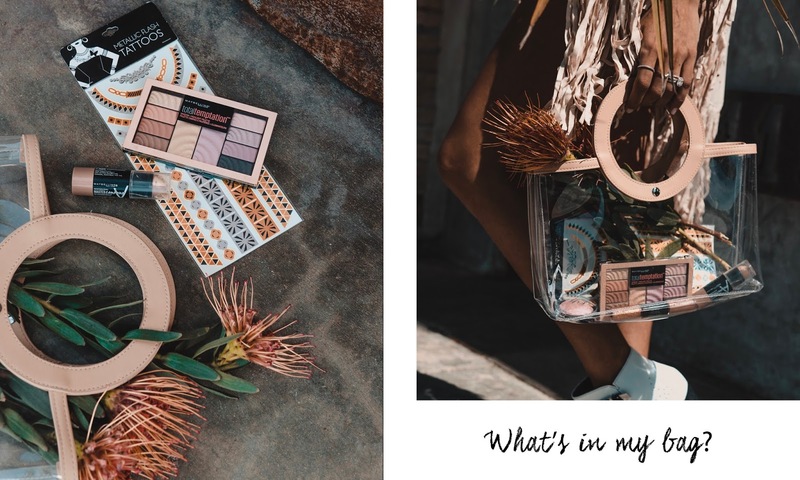 A blog and The Life In Between : Beauty spotlight: Festival makeup. Want to know what's in my bag for the weekend in the desert? As I mentioned on my recent Instagram post I am no makeup guru. I am always looking to add makeup products that are both - affordable and aren't too complicated as I know nothing about layering or contouring. To be honest just a few months ago I introduced my face to a highlighter and let's be honest that's a big step for me! My beauty routine is super simple and I believe that the less makeup you wear the less you take away from your natural beauty and the longer it lasts! That's why most of the time my go-to places for makeup are stores like Walmart that will have anything you may need all under one roof! Going there for all the festival necessities was also a no brainer. I have partnered with Walmart to show ya'll what's in my bag that include some of my absolute must-have products that I will be bringing along with me to the desert this week! A few of these items you have seen before on my Instagram which include an easy to use contour stick (if I can do it, you can too) and my favorite eyeshadow palette! 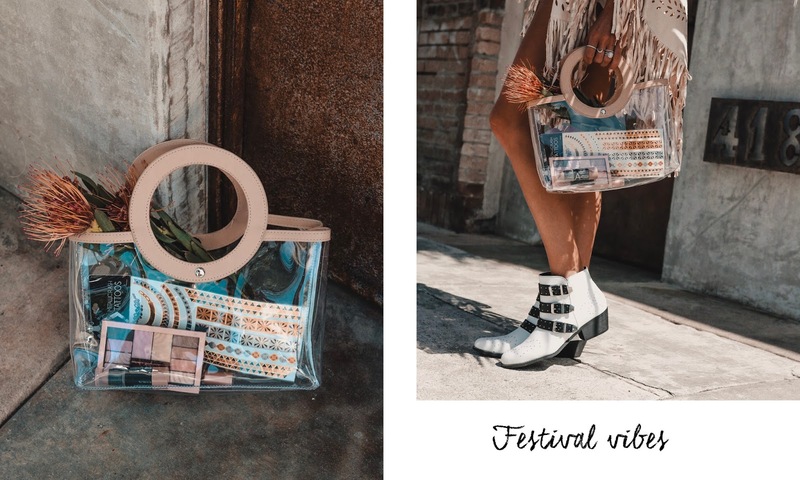 Because festivals are all about the outfits you also want to make sure you don't let makeup take away all the attention away from the outfit and let it be the main focus of your look. Below is the list of items that I personally love and that are in my makeup bag as not only my daily essentials but festival as well. Maybelline New York Total Temptation Shadow + Highlight Palette. A fun palette that offers all you need in one, everything from neutrals to shades with a bit of sparkle! Mettalic Flash Tattoos. What's a festival without a tribal, boho tattoo? Because I don't have any tattoos I find it super fun and convenient to just add it on for a fun weekend and wash it off once the events are over. If you plan on adding a lot of accessories make sure to minimize the tattoos and add them to places where you will not have accessories. Ex: if you will have lots of bracelets on simply add tattoos on your back or ankles. Maybelline Facestudio Master Contour V-Shape Duo Stick. Literally one of my all time favorite items of my makeup bag. I got it last year and have done many mini makeup tutorials on it so if ya'll have been following me along via Instagram stories I am sure you've seen me obsessing over it at one point of time. I have them in all the colors, however my go-to shade is "light" as it offers a good basic color under eyes and cheeks all year around. Meanwhile medium and dark are great to bring along if you're traveling and plan on getting a tan! I have linked all the items from this post as well as some of my other favorites below where you can simply click on the item you want to see more of and shop it. Don't forget that if you need last minute essentials for an upcoming festival Walmart has it all! Thank you Walmart for partnering with me on this post. Wow!It's a new knowledge for me.Thanks! Well,to move with the trend having best makeup lesson is a very crucial thing. Learning from someone who barely knows will go only in vain. So I prefer experts for this. I agree that minimal is best. A face shouldn’t be covered completely that is the beauty ! Characterizing magnificence isn't simple. Truth be told, for each culture, it implies something marginally extraordinary. A clan in Africa get female magnificence mean a breathtaking, shapely lady, while society in America needs their ladies to be thin as nails.